VN and VCN coatings were prepared using multi-arc ion plating technique on 316L stainless steel and single silicon substrates. 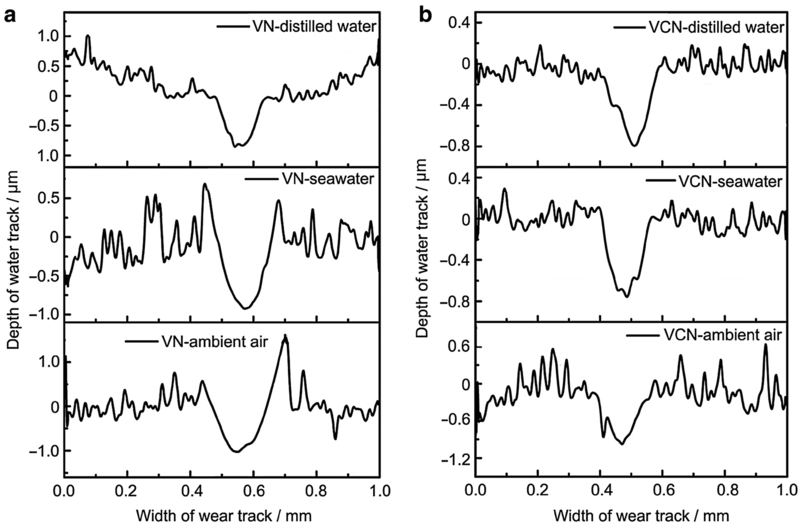 Microstructures, mechanical performances, corrosion behaviors and tribology properties of VN and VCN coatings in the atmosphere, distilled water and seawater were contrastively tested. It was confirmed that the VCN coating had a typical nanocystallite/amorphous structure. Moreover, the hardness increased from 30.5 to 36.5 GPa and the corrosion current density decreased from 2.16 × 10−6 to 0.82 × 10−6 A cm−2 after carbon was doped into the VN coating. Compared with the VN coating, the VCN coating had the lowest friction coefficient of 0.26 and wear rate of 0.68 × 10−6 mm3 Nm−1 in seawater, which could be ascribed to the lubrication of graphitization transfer film and improvement of the comprehensive performance. 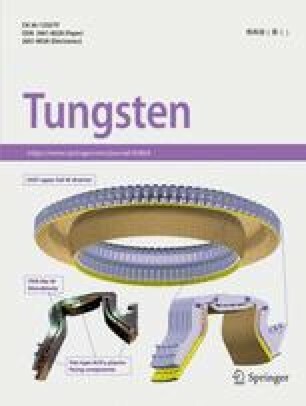 Recently, with the development of the marine economy, highly efficient and environment-friendly operations have gained increasing attention for some friction assemblies such as turbine engine and hydraulic bearing [1, 2, 3, 4, 5, 6]. As a result, credible lubrication, superior wear resistances and ideal corrosion resistances for these critical components in seawater have gradually become a vital focus [7, 8]. Thus, creating effective anti-wear and lubricious materials for related applications are a potential method to solve this problem . VN coatings deposited by the PVD technique have some advantages of high hardness, good critical loads and excellent wear resistances, which have been widely used to improve the surface properties of materials [10, 11, 12, 13]. For example, Mu et al. successfully prepared the VN coating by the cathodic arc ion plating technique and found that the VN coating showed a high hardness of 30 GPa and a good critical load of 50 N. Moreover, Escobar et al. deposited the VN coating using a magnetron sputtering system and displayed that the wear of the flank wear with VN coated was 13% lower than that of the uncoated one. Nevertheless, the VN coating revealed a high friction coefficient in some harsh conditions. For instance, Aouadi et al. studied the friction behaviors of the VN coating and discovered that the coefficient of friction (COF) of the VN coating was relatively high (0.45–0.8), especially at room temperature. Thus, the addition of carbon can be used to reduce the friction and wear of the coating, as confirmed by some researchers [5, 14]. From the researches on the tribological properties of VN and VCN coatings at different severe conditions, those researchers found that the VCN coating could present better anti-wear properties than the VN coating . Because the VN and VCN coatings presented a great potential value on anti-friction and anti-wear aspects, there were rare reports about the friction and wear behaviors of VN and VCN coatings in seawater. Therefore, this paper tries to reveal the friction and wear mechanisms of VN and VCN coatings in seawater and provides a feasible way to solve the problems of marine equipments. The VN and VCN coatings were deposited by a multi-arc ion plating technique in a PVD coating machine on 316L stainless steel and Si (100) wafer substrates. The 316L stainless steel substrate was polished to a roughness of 40 ± 5 nm and ultrasonically cleaned in acetone and ethanol for 20 min, respectively. After that, the substrates were held on a turntable with a conventionally rotational speed. Before deposition, the temperature was set to 350 °C and the cavity chamber was controlled at 4 × 10−3 Pa. Furthermore, argon ion beams with a bias voltage of − 1000 V, as well as a time of 6 min were used to bombard the 316L stainless steel substrates to eliminate surface contaminants. Moreover, three V targets (purity 99.95 wt.%), 63 mm in diameter, were employed as the source materials. The VN coating was deposited in N2 (purity 99.95%) of 350 sccm, while the VCN coating was deposited in N2/C2H2 (purity 99.95%) of 350/35 sccm, with a target bias voltage of − 70 V, target current of 60 A, work pressure of 0.4 Pa and deposition time of 2 h.
Scanning electron microscopy (SEM, FEG 250) was adopted to observe the cross section morphology of the VN and VCN coatings. X-ray diffraction (XRD, Bruker D8 X-ray facility) was used to measure the crystal structure of as-deposited coatings. An X-ray photoelectron spectroscopy device (XPS, AXIS Ultra DLD) was adopted to measure the chemical components and element chemical state of both coatings. In addition, transmission electron microscope (TEM, FEI Tecnai F20) was chosen to deeply analyze the internal microstructure of the as-deposited VN and VCN coatings. The Alpha-Step IQ profile meter was used to measure the surface roughness of the coatings. Six times measurements were applied and the average value was obtained. Moreover, the MTS Nano Indenter G200 system was employed to obtain the hardness (H) and elastic modulus (E) of both coatings, and six positions were chosen for the test. The 273A electrochemical workstation was built to characterize the electrochemical behaviors of these coatings in seawater, and the composition of seawater was deployed according to the ASTM D 1141–×98 standard. At 17 °C, the platinum plate with an exposed area of 1 cm2 and saturated potassium chloride were selected as the counter electrode and the reference electrode, respectively. Furthermore, the corrosion potential (Ecorr) and corrosion current density (icorr) of the coatings in seawater were obtained from the Tafel curves. A UMT-3 ball-on-disk tribometer (CETR, USA) was used to carry out the tribology experiments of the as-deposited VN and VCN coatings in ambient air, distilled water and seawater conditions. During the experiment, the applied load was 5 N, the working frequency was 5 Hz, the operation time was 1800 s and the test temperature was 20 °C. For the friction counterparts, Si3N4 balls with a diameter of 3 mm were selected. Besides, the friction coefficients were recorded automatically and continuously during the testing, and the wear rates were calculated by cross-sectional profiles of wear tracks. Afterward, scanning electron microscope (SEM, S4800) was adopted to observe the wear morphologies of both coatings in different environments, while the micro-Raman spectrometer (Horiba Jobin–Yvon HR800) was used to explore the compositions of the transfer film on the counterpart surface. 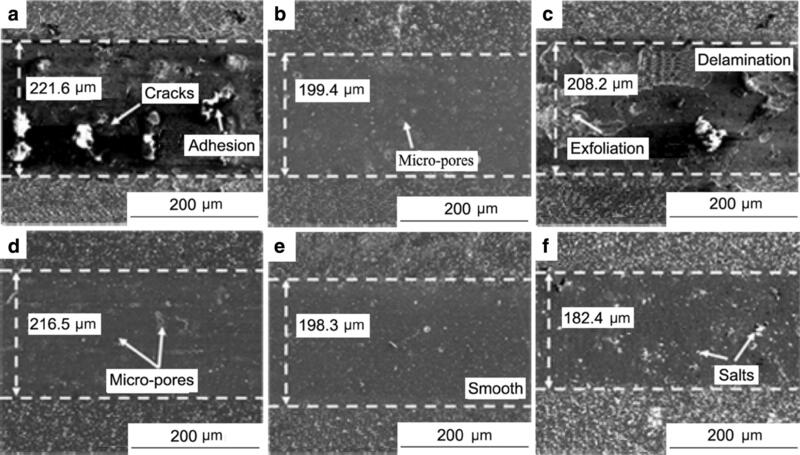 The cross-sectional and surface SEM images of the VN and VCN coatings are shown in Fig. 1. 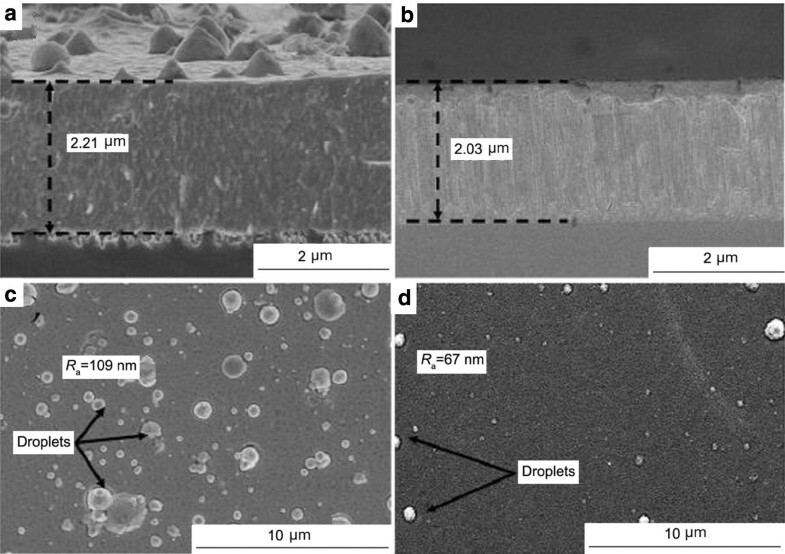 It was clear that the VN coating exhibited a typical columnar crystal structure and some obvious defects (micro-cracks and micro-poles) were observed on the coating inside (Fig. 1a). Meanwhile, the surface roughness and coating thickness of the VN coating were ~ 109 ± 13 nm and 2.21 ± 0.27 µm, respectively (Fig. 1a, c). After carbon was doped into the VN coating, the number of defects was significantly reduced and the microstructure became more compact and presented a tendency of amorphization (Fig. 1b). In addition, the surface roughness and coating thickness of the VCN coating decreased to 67 ± 7 nm and 2.03 ± 0.21 µm, respectively (Fig. 1b, d). The elementary components of the as-prepared VN and VCN coatings are listed in Table 1. 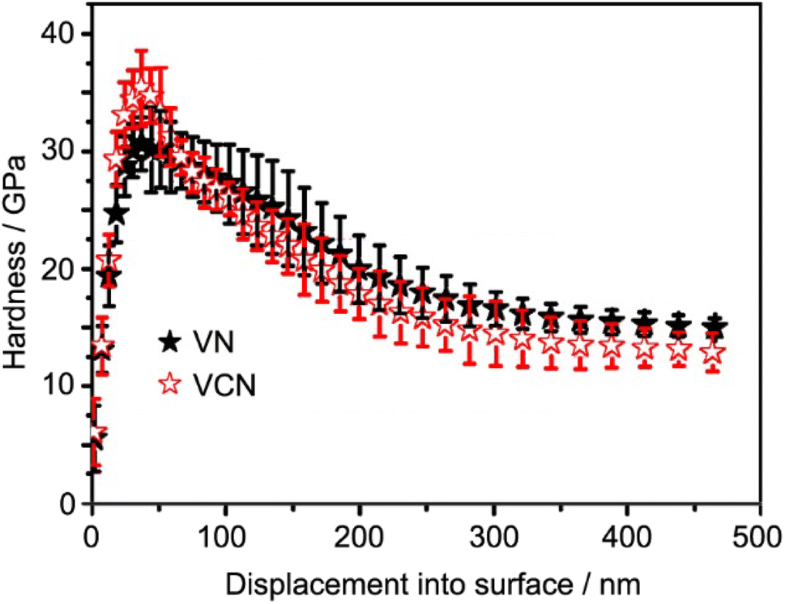 It was clear that the VN coating was composed of 48.32 at.% V and 51.68 at.% N. After the doping of carbon into the VN coating, the content of nitrogen decreased to 37.01 at.% and the content of vanadium remained stable, which indicated that the position of partial nitrogen atoms might be replaced by some carbon atoms. To confirm this phenomenon, the phase structures of as-deposited coatings were characterized (Fig. 2). The peaks corresponding to VN (111), VN (200) and VN (220) were observed in the XRD patterns of the VN coating. 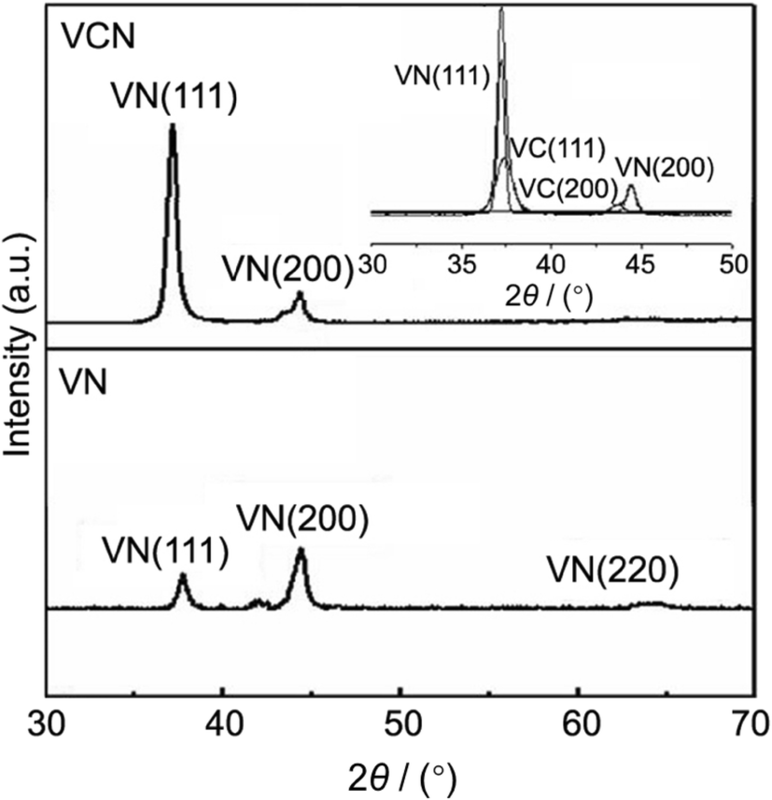 However, only a strong preferred orientation of VN (111) and a weak peak of VN (200) were found in the XRD patterns of the VCN coating. Through fitting, the peak at 36.9° could be divided into VC (111) and VN (111). Meanwhile, the peak at 44.2° could be separated into VC (200) and VN (200), proving the formation of the VC phase in the VCN coating. Unlike the crystalline phase, some amorphous phases were difficult to be detected by XRD, which might also appear in the coating after carbon was doped into the nitride coating. Therefore, the XPS result of the VN coating is illustrated in Fig. 3. The spectrum presented two complex peaks at the binding energies of 283.1 eV and 285.9 eV. Through Gaussian fitting, the C 1s spectrum was matched by C-V, sp2C-C, sp3C-C and C-O bonds, which located at 283.1 eV, 284.5 eV, 286 eV and 287 eV, respectively [17, 18, 19, 20]. 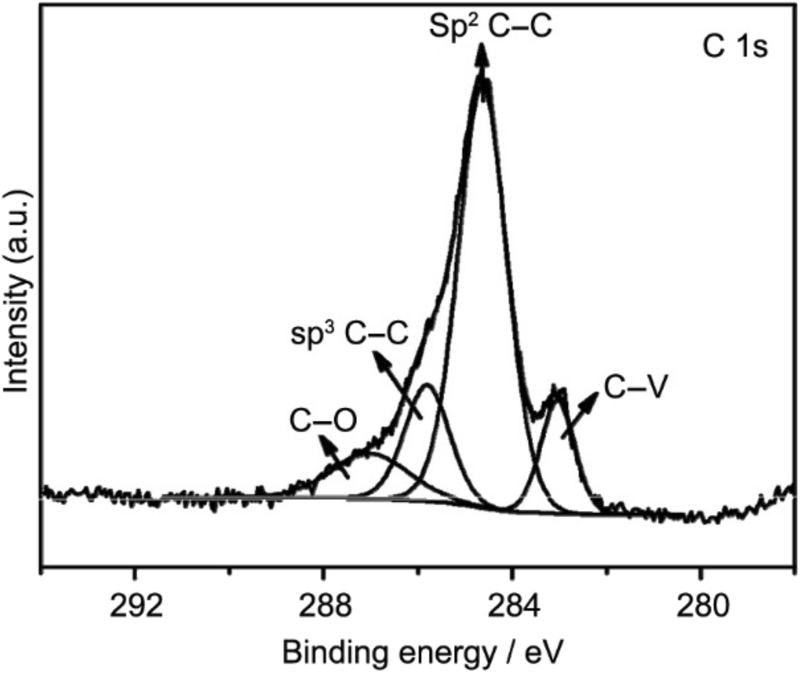 From the integral area of each component, it was easy to see that the atomic concentrations of C element involved in C-V, sp2C-C, sp3C-C and C-O bonds were ~ 11.6 at.%, 62.3 at.%, 15.6 at.% and 10.5 at.%, respectively (Table 2). For further understanding the microstructure, the TEM micrographs of the as-deposited VN and VCN coatings were conducted. For the VN coating, as seen in Fig. 4a, the high-resolution TEM image exhibited two types of fringe spacings in the VN coating, i.e., 0.2384 nm and 0.2065 nm, respectively, which were exactly indexed to the VN (111) and VN (200) crystal faces compared with the VN standard (JCPDS card No. 35-0768) [16, 21]. At the same time, the electron diffraction patterns could well explain the characteristic of the VN lattice, where the diffraction ring corresponded to the VN (111), VN (200) and VN (220) phases; Meanwhile, a discontinuous state also appeared on this image. Compared with the VN coating, the VCN coating presented a distinct nanocystallite/amorphous microstructure, where a large number of amorphous regions were observed within the high-resolution TEM image and a few regular crystalline regions were randomly inset in the amorphous region (Fig. 4b). Through measurement, the grain size was ~ 4–8 nm, and the crystalline region with the lattice spacings of 0.2383 nm, 0.2376 nm, 0.2094 nm and 0.2065 nm corresponded to the VN (111), VC (111), VC (200) and VN (200) phases, respectively. Simultaneously, the VC (200) plane was symmetric with an angle of 64.2°, thus forming a twin crystal structure. This structure could effectively prevent the shift of dislocations. In addition, the selected area electron diffraction pattern of the VCN coating exhibited a continuous state (inset in Fig. 4b). Through the above analysis, the VN coating was mainly composed of the VN phases, while the VCN coating largely consisted of the VN, VC and amorphous carbon phases. The fracture toughness is a physical quantity that measures the ability of the material to resist crack initiation and propagation. Dang et al. pointed out that the fracture toughness of the coating was proportional to H3/E2, where H refers to the hardness and E indicates the modulus. The hardness value are displayed in the nanoindentation curve of the as-prepared VN and VCN coatings (Fig. 5), and H, E and H3/E2 are listed in Table 3. As a whole, the hardness of the VN and VCN coatings increased first, followed by a decrease with the rise of the indentation depth. The highest value at the platform indicated the hardness of the coating [23, 24]. For the VN coating, the hardness was ~ 30.5 ± 4.1 GPa, while the hardness value of the VCN coating was up to 36.5 ± 3.8 GPa after carbon was doped into the VN coating. Through comparison, this hardness value of the VCN coating was 16.4% higher than that of the VN coating, which was mainly due to the formation of the VC strength phase and the special nanocystallite/amorphous structure. Besides, the moduli of the VN and VCN coatings were ~ 424.8 ± 27.9 and 389.9 ± 21.2 GPa, respectively. Through calculation, it was verified that the VCN coating with an H3/E2 ratio of 0.32 GPa revealed a more excellent fracture toughness and anti-wear than the VN coating with an H3/E2 ratio of 0.16 GPa. The evolutions of Tafel polarization curves of the as-deposited VN and VCN coatings are displayed in Fig. 6. Clearly, when the Ecorr reached 1 V vs. SCE, the curve of the VN-coated specimen showed a strong passivation region. 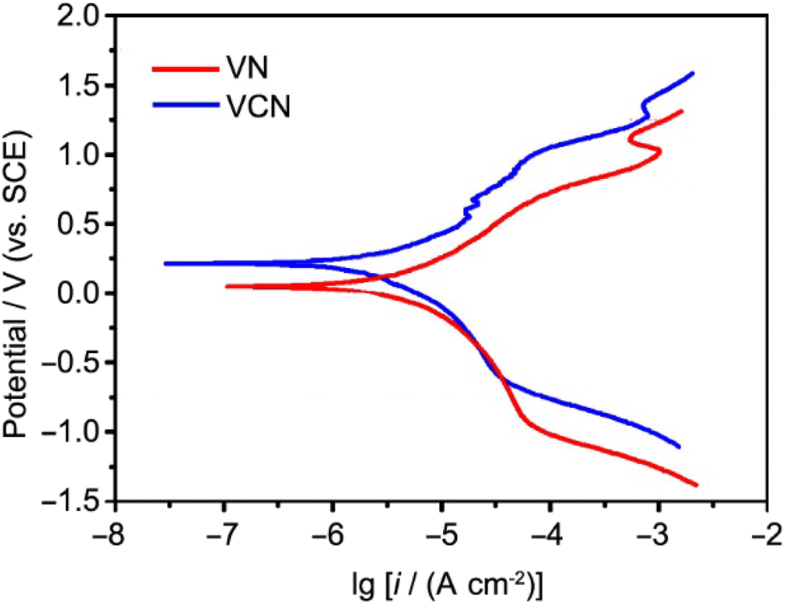 However, two slight passivation regions were found in the curve when the Ecorr of the VCN-coated specimen reached the values of 0.6 and 1.25 V vs. SCE. The Ecorr and icorr of both coatings are listed in Table 4. The Ecorr of VN-coated specimen was ~ 0.04 ± 0.003 V vs. SCE, which was one order of magnitude lower than that of the VCN-coated sample (0.21 ± 0.013 V vs. SCE); The icorr of the VN-coated sample was ~ 2.16 ± 0.190 × 10−6 A cm−2, which was one order of magnitude higher than that of the VCN-coated specimen (8.2 ± 0.64 × 10−7 A cm−2). The friction behaviors of VN and VCN coatings deposited on 316L stainless steel sliding against Si3N4 counterparts in ambient air, distilled water and seawater are shown in Fig. 7. Generally speaking, the friction curves displayed the trend of rising sharply at first, followed by slow descending and then reached a stable state (Fig. 7a). Moreover, it was clear that the friction curves of the VCN coating were below those of the VN coating under the same condition. Figure 7b shows the average friction coefficient of both coatings in different conditions. The three values for the VN coating in ambient air, distilled water and seawater were ~ 0.62, 0.42 and 0.41, respectively. 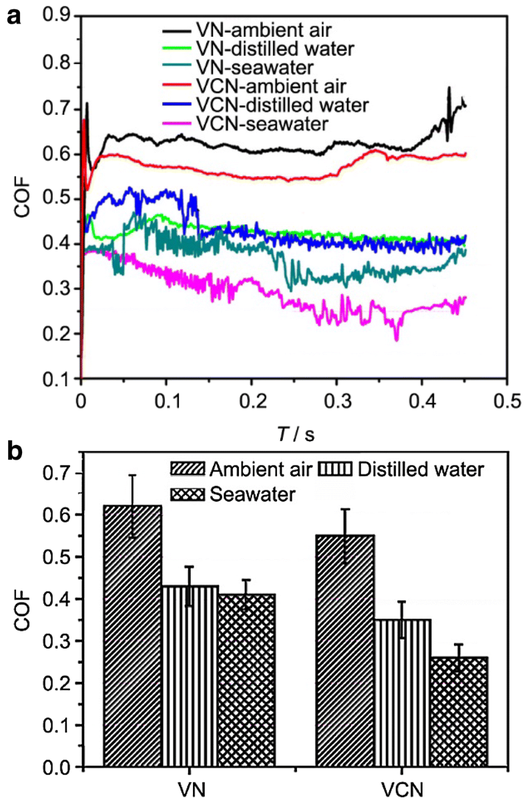 For the VCN coating, the average coefficients of friction under ambient air, distilled water and seawater were ~ 0.55, 0.35 and 0.26, respectively. It could be seen that the friction coefficients for both coatings in seawater were the lowest. It was mainly due to the lubrication of water and some tribochemical products. In the friction process, the water molecules would be adsorbed on the coating surface, which could avoid the direct contact between the coating and counterpart, thereby playing a certain lubrication . In seawater, calcium ions and magnesium ions would react with carbonate and hydroxide to form CaCO3 and Mg(OH)2, which acted as lubricants . Also, comparing with the friction results of the VN and VCN coatings, it can be found that the doping carbon could significantly reduce the friction behaviors of the VN coating under different conditions. That was to say, the friction coefficients were reduced from 0.65 to 0.55, 0.42 to 0.35 and 0.41 to 0.26 under the conditions of ambient air, distilled water and seawater, respectively. Besides, it was reasonable that the surface roughness played a key role in affecting the friction coefficient of the coating. The high surface roughness would cause a reduction of the actual contact area between the counterpart and coating, leading to the concentration of a high load on a small area and ultimately enhancing the coefficient of friction . For better understanding the wear situation, the cross-sectional profiles of wear tracks on the VN and VCN coatings were investigated in all environments. As shown in Fig. 8a, the maximum depth of wear track for the VN coating in ambient air, distilled water and seawater were ~ 1.03, 0.81 and 0.94 μm, respectively. Obviously, the maximum depth of wear track in distilled water was the minimum, which was 21.6% and 13.8% lower than that in ambient air and seawater, respectively. However, the VCN coating displayed a different feature on the wear depth compared with the VN coating. The VCN coating presented the highest maximum depth of 0.96 μm in ambient air, while it acquired the lowest maximum depth of 0.78 μm in seawater (Fig. 8b). Also, the maximum depth of wear track in seawater was 18.8% and 3.8% lower than that in ambient air and distilled water, respectively. In the case of this coating, the maximum depth of the wear track for the VCN coating showed a significant decline compared with the VN coating under the same conditions. Exactly, the maximum depths of the VCN coating in ambient air, distilled water and seawater were 6.8%, 2.5% and 17.1% lower than that of the VN coating, respectively. Figure 9 shows the wear rates of VN and VCN coatings deposited on 316L stainless steel sliding against the Si3N4 counterparts under different conditions. These values for the VN coating in ambient air, distilled water and seawater were ~ 1.78 × 10−6, 0.98 × 10−6 and 1.05 × 10−6 mm3 Nm−1, respectively. 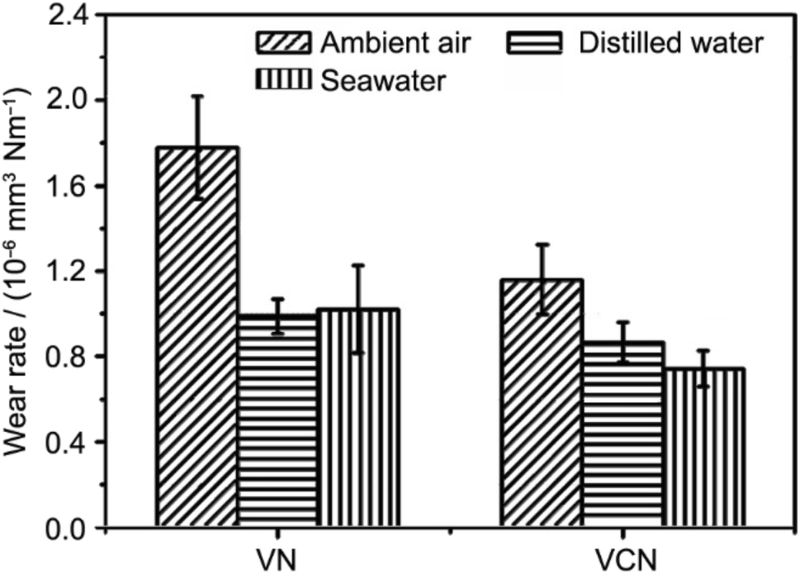 For the VCN coating, the wear rates under ambient air, distilled water and seawater were ~ 1.18 × 10−6, 0.82 × 10−6 and 0.68 × 10−6 mm3 Nm−1, respectively. By comparing the test results of both coatings, it could be found that the addition of carbon could significantly improve the wear behaviors in different conditions, which was consistent with the result of H3/E2. Another important reason might be attributed to the columnar structure of the VN coating, which was beneficial for the intrusion of ions and water molecules and the erosion of the coating. The corrosion strongly accelerated the wear under the cooperation of mechanical and chemical functions. However, the VCN coating presented a dense structure and it was more difficult for ions to degrade the coatings. Wear track can effectively reflect the wear mechanism of coatings in different conditions, as seen in Fig. 10. Different coatings sliding against the Si3N4 counterpart in different conditions showed different characteristics. For the VN coating, the width of the wear track was ~ 221.6 μm in ambient air, which was the largest value among all specimens (Fig. 10a). At the same time, the wear track presented a rugged topography, with some debris distributed on the surface of the wear track during the friction process. Part of the debris was retained in the wear area, with others transferred to both sides of the wear track. The retained debris could be squeezed to form some adhesion substances on the worn surface, which might desquamate or craze in some places under the effect of reciprocating extrusion. However, the width of wear track decreased to 199.4 μm in the distilled water condition, which was 10.02% lower than that in ambient air. The wear track was smooth and flat, with only some micro-pores observed on the surface (Fig. 10b). This was due to the lubrication of the water film and friction chemical products. Shan et al. reported that Si3N4 would react with water to form amorphous hydrate Si(OH)4, which acted as a hydrodynamic lubrication film in reducing the friction and wear. In seawater, the width of the wear track increased to 208.2 μm, which was 4.23% higher than that in distilled water. There were some obvious desquamations and delaminations on the wear track, which could be attributed to the synergistic action of both mechanical and corrosion aspects (Fig. 10c). Under the mechanical action, the coating was liable to deform or even crack. In this case, the chloride ions in seawater showed a powerful negative function, which could easily enter the crack to induce corrosion; and then, it would promote the expansion of crack, thereby realizing wear aggravation. The increased wear triggered more defects and aggravated the corrosion action, finally forming a vicious circle . Compared with the VN coating, the width of the VCN coating was ~ 216.5 μm, which was 2.31% lower than that of the VN coating in the atmospheric condition (Fig. 10d). The wear track of the VCN coating was flat except for some micro-poles due to the lubrication of the sp2C-C phase, indicating that the adhesion behavior could be significantly relieved by carbon doping. Nevertheless, the features and width of the wear track were similar to those of the VN coating in the distilled water condition (Fig. 10e). It was easy to see that the wear track was dramatically narrowed with a minimum width of 182.4 μm in seawater, which was 12.39% lower than that of the VN coating. Besides, the wear track was smooth and some white salts could be found on the worn surface (Fig. 10f). These phenomena were caused by two facts. Firstly, the VCN coating with a high toughness could effectively inhibit the formation of cracks and the generation of corrosion; secondly, the graphitization transfer film might form on the contact surface, which could obviously reduce the shear stress during sliding. 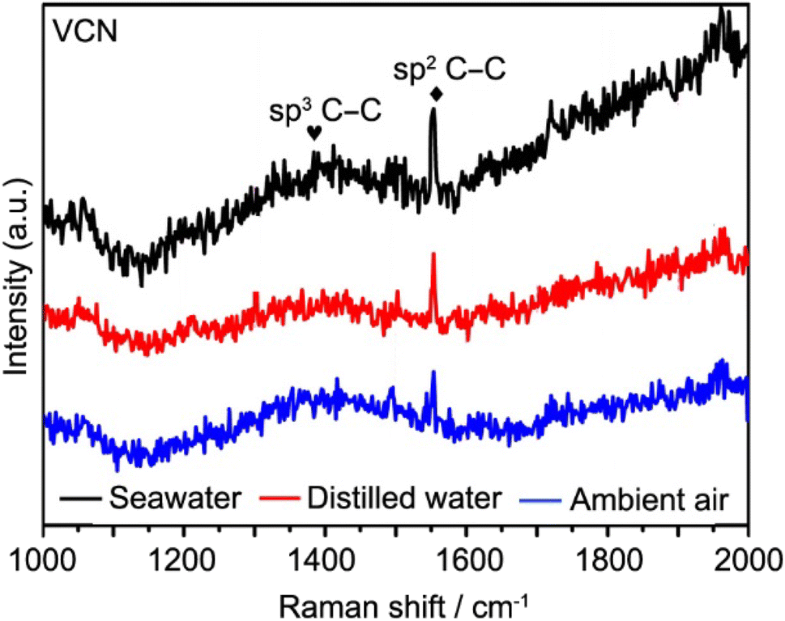 To confirm the existence of graphitization transfer film on the contact surface, the Raman analysis of the Si3N4 counterpart was conducted (Fig. 11). It was clearly seen that a peak at ~ 1568 cm−1 could be observed in the spectrum, which was in correspondence with the peak position of graphitization. The effect and mechanisms of sp2-hybrized carbon lubricating could be explained as follows: the planar 2D graphite-like structure of the sp2-hybrized carbon on the surface would reduce the strenth of the dangling σ bonds on the clean surface, thereby avoiding the strong adhesive interaction between contact surfaces. Further, it could result in the low surface energy of the VCN-coated substrates . The frictional shear resistance could be reduced due to the adhesive interaction being proportional to the surface energy of the contact face ; at the same time, the shear-induced graphitization could promote the generation of graphite transfer films on the surface, which would reduce friction and wear [32, 33, 34]. Simultaneously, the peak intensity reached the highest value in seawater and the lowest value in the atmospheric condition, indicating the highest degree of graphitization and the best lubrication in seawater. An innovative VCN coating was prepared by the addition of carbon into the VN matrix on 316L stainless steel and Si (100) substrates using a multi-arc ion plating technique. The characterization of microstructure displayed that the as-deposited VCN coatings showed a nanocrystallite/amorphous structure, which was made of the VC phase, VN phase and amorphous carbon. When carbon was doped into the VN coating, the hardness of the VCN coating increased to 36.5 GPa and the corrosion current density decreased by an order of magnitude. The friction coefficients and wear rates of both coatings at all conditions showed significant differences. The lowest friction coefficient was gained in seawater and the highest in ambient air, which were closely related to the lubrication of the tribochemical products. The prominent mechanical performance, the excellent corrosion resistance and the generation of graphitization transfer film could mainly explain the reduction of COF and wear rate of the VCN coating in different conditions, especially in seawater. This work was supported by the Program of Qingjiang Excellent Young Talents, Jiangxi University of Science and Technology, Natural Science Foundation of Jiangxi Province (Grant 20181BBE58001) and Natural Science Foundation of Jiangxi Education Department (Grant GJJ180431).